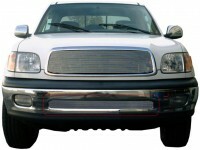 25956: 99-02 Toyota Tundra Bumper Billet Grille. This polished billet bumper grille comes complete with hardware and installation instructions. Installation time is about 1/2hr. Bolts directly into bumper opening. This is the bumper billet grille only. Backed by manufacturers five year warranty. Made in USA.